The Aqaba Gulf hosts the Eilat Port from Israel and the Aqaba Port in Jordan. The Tiran Strait represents the gulf’s Southern border from the other side. The gulf has a length of 160 kilometers and the average width of 24 kilometers in some parts with the depth of around 1000 the most. However, from various places in Sinai, one can view other cities and countries in the other nations. Away from its strategic importance, the Aqaba Gulf represents wonderful opportunities for diving and snorkeling. In fact, Dahab, Newiba, and Taba in Egypt, overlooking the Aqaba Gulf welcomes hundreds of tourists who wish to explore the treasures of the underwater. Away from Sinai, Eilat in Israel is an important port and touristic destination with a population of half a million inhabitants. Aqaba is also a very significant port and city in Jordan with a population that exceeds one million people. These regions also welcome many tourists especially from Europe. The borders of the nations located around the Aqaba Gulf have been settled in the early 20th century when Great Britain and the Ottoman Empire held a conference and decided they would have these borders we see today. 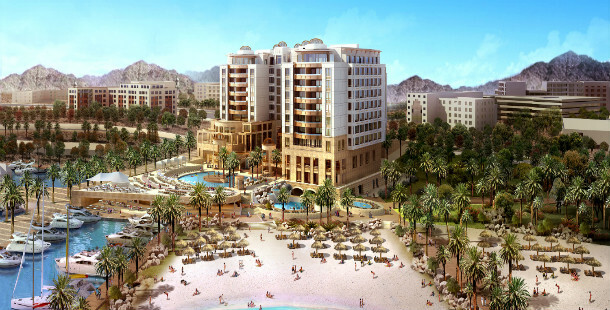 Aqaba city is a Jordanian coastal city situated at the northeastern tip of the Red Sea. Aqaba is the largest city on the Gulf of Aqaba and Jordan's only coastal city. Blessed with location, Aqaba was a prime port even in ancient times; its history dates back some 5,500 years. The city of Aqaba has one of the highest growth rates in Jordan, with only 44% of the buildings in the city being built before 1990. The city of Aqaba is the southernmost part of Jordan and the capital of Aqaba Governorate. Aqaba may be on the precipice of rediscovery, but the city itself has long held intrigue. However, industrial and commercial activities remain important, due to the strategic location of the city as the country's only seaport. It also offers activities which take advantage of its desert location. Its many coffee shops offer mansaf and knafeh, and baqlawa desserts. Aqaba and Wadi Rum are the sites of the annual Jordan Middle East Distant Heat Festival, an annual electronic dance festival.